So this past weekend, Sam and I decided to meet up for another brunch session–at this point, it certainly has become a weekly tradition for us! Ivy Place is a gorgeous restaurant located in the Daikanyama T-Site Garden with a large terrace and many surrounding greens. As with all lovely restaurants in Tokyo, there’s always a wait on weekends. However, Ivy Place allows you to leave your phone number so that you can stroll around the T-site while you wait (a huge perk to me!). In the meantime, we found a weekend farmers market and although we didn’t get anything, people were certainly purchasing a variety of baked goods and fresh produce from the cheery-looking stands. Ivy Place very much feels like a gorgeous house set in a lush garden–probably why it is so popular! Luckily, we were quickly seated within 20 minutes and managed to get lovely terrace seats. As it was closer to lunch time, Sam and I decided to split their Crunchy Thai Salad and Smoked Salmon Flatbread Pizza. Seeing lots of ice teas and juices being served, we chose their Homemade Pineapple Cooler with Hibiscus (to describe it very colloquially, it was refreshing and awesome). But of course, the Buttermilk Pancakes I’ve been looking forward to had to be ordered too! For the pancakes topping, you have a choice between Maple Syrup or Acacia Honey, and also whether you want Fresh Cream or Fresh Fruits on top. We opted for the maple syrup and fresh fruits, which in my opinion was nice and fruity (although I did see many tables get a generous amount of fluffy cream added to theirs). A close up of the flatbread–the salmon was really really fresh! Fresh fruits–the freshly pitted cherries were delicious! And combined, Ivy Place’s pancake is another Tokyo pancake lover’s must-try! I really enjoyed Ivy Place and for a sunny day, its terrace seats in such a gorgeous area alone is worth waiting in line for. 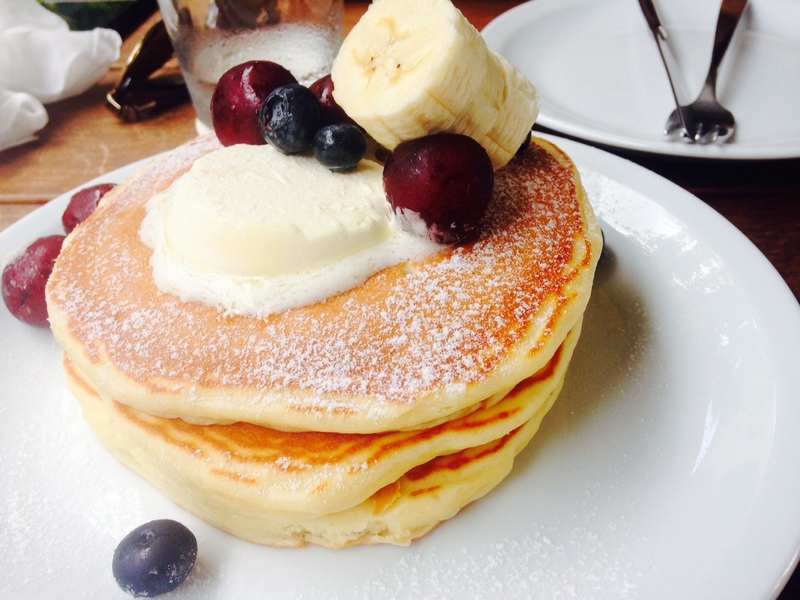 Definitely try their Buttermilk Pancakes with the fresh fruits and afterwards, take an afternoon exploring the lively Daikanyama area! OMG, I love that place — and Daikonyama.